I was testing two different CFLs looking for differences in their spectra. Since I found that there are different CFLs, some closer to daylight than others. They seem to be clearly different. I am wondering which one should be the best to use for calibration? I think this is something that should be further researched. I found this interesting note by @dhaffnersr suggesting one type of light 23W 2700K soft light works the best. Hey Matej, there's something going wrong with the way your second and third sets are showing up there! They've got all of those squiggles showing up that do not appear in the original spectra. 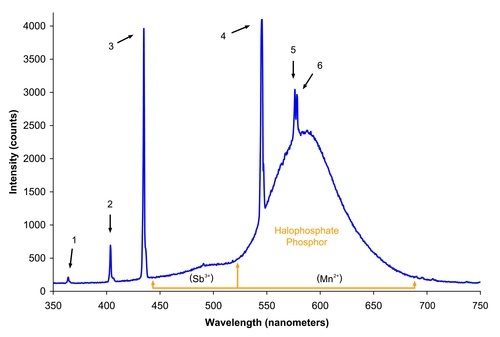 Compare your spectra from the first bulb, the Sylvania Daylight bulb, with this spectrum from Wikipedia of a halophosphate phosphor lightbulb (see the comment below for the image). 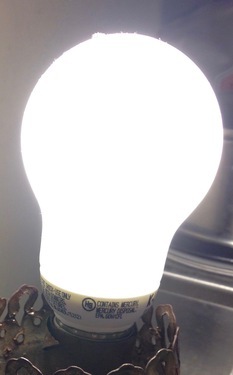 The spectra appear different because this bulb uses a completely different set of phosphors than modern CFL bulbs. However, it still has the two mercury emission lines that are used for calibration in spectral workbench so I think it should still work to calibrate off of it. May I ask why you are smoothing your spectra here? I don't think it is a good idea because you want to get as much resolution as possible for calibration. 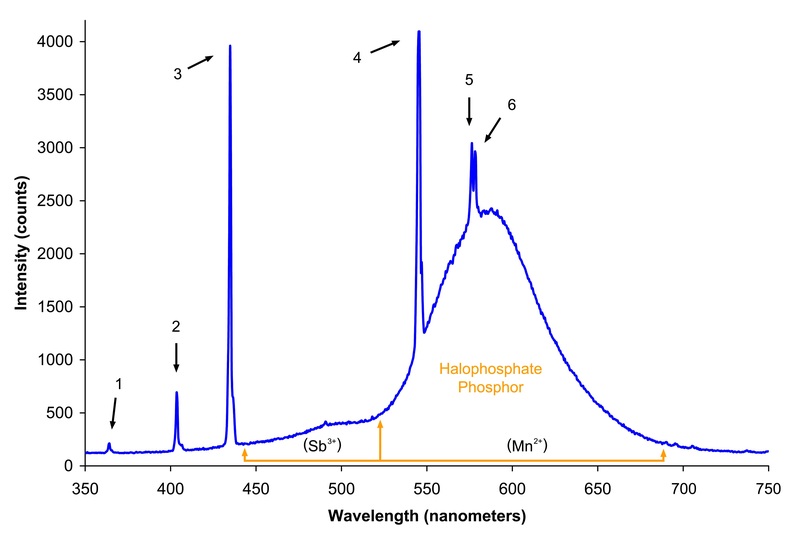 In your original spectra (for the CFL bulb) you can distinguish two green peaks, one at 540 and one at 545. When you smooth out your data, these two peaks get smeared together, resulting in a less accurate calibration because you are lumping together the spectral line for terbium with the mercury peak that you are actually trying to detect. Hello Matej! Those "humps" that you are getting from the daylight bulbs are the very reason I don't use them, that continuous band on the blue spectrum gives poor calibration, it's thru trial and error that I found that out and working with Dave Stoft on getting my spectrometer working right. I found the 23W softer light bulb (which equates to a 100W bulb as far as lumens,) has well defined vertical bands that are easier to calibrate, no matter what width of slit you are working with, I have found that the narrower slit size gives more resolution and a better "quality fit" on calibrating. Hi, Matej - it also looks like some of your spectra are not calibrated, or perhaps not properly? I'm seeing some not aligned. But all of them seem suitable for calibration, as Ethan points out -- because the calibration described here uses the 436nm and 543nm lines as references, and all of your spectra seem to show those (although Ethan is right, some are obscured by the smoothing you've applied). I'm really not sure where those squiggles are coming from, though! Huh. Do they show up when you try to compare one of these spectra by adding them in the Compare interface? Dave, I don't think it's quite accurate to say that they give poor calibration. They may result in a poor "fit" because they don't exactly match the intensities in the reference spectrum we use to calibrate. But the calibration itself will still be good -- it's the comparison with the reference that suffers. Hey Jeff, your right I just thought about it, it will calibrate, it's just you can't get a good fit. Hi Jeff, Thanks for the info about the bug! I Will recalibrate right away. I discussed with Gretchen and I think I will keep using this bulb since I did all other spectra on this one. However. Good to know about the "differences" between the Hg Lights. @ethanbass for calibration I am not smoothing the spectra. I just thought it could be helpful when comparing them and adding them to a set. @warren: in response to: "Can you try re-calibrating this one, as I think it was calibrated during a brief bug (it shows being calibrated on 1/26/16) which was since fixed. I hope that will fix at least one of your graphs: https://spectralworkbench.org/spectrums/69433"
I tried to recalibrate pretty hard but did not worked out. Actually I am not sure how to compare this particular spectrum to the SW calibration sample. I have a feeling that this CFL daylight spectrum we are talking about is missing some of the peaks necessary for the calibration. Or perhaps I am having a hard time locating them. Does someone have any suggestions about this? Actually this looks calibrated, no? Interesting. I actually did kind of an "educated guess" calibration but I couldn't find more but one blue peak. I know that in the "usual" CFL there are three. Sometimes one of the three is not visible which leaves two. But in this case we have only one. That's kind of confusing... Perhaps one blue peak is diffused/blurred? But, this shows which of the green peaks and blue peaks is appropriate to calibrate with the tube fluorescent, if you later do that. Cool! Thanks Jeff! This is helpful.